In 1858, Abraham Lincoln made his famous “A house divided cannot stand” speech. He was debating Stephen Douglas about the issue of slavery. Douglas believed that each new territory or state should be allowed to decide whether it would permit slavery. Lincoln believed that the nation as a whole should take stand. At the time, a lot of people believed whites to be superior to blacks and that owning another person was justified based on skin color and bank account size. We all know who eventually won that debate. But even after the slaves were free, too many people still believed in a superior race. And, for more than century, too many laws reflected their beliefs. 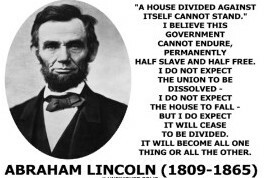 Now, more than 150 years later, I wonder how history will portray the politics of 2012 when the United States is once again a house divided. Only this time, instead of being divided over slavery, we are divided about the purpose of government. But there is also an underlying debate very similar to the one being waged during the Civil War. Too many people still believe that some individuals are superior to others. Only instead of color, they are claiming superiority based on the size of their bank account or their employment status. We have become a country that is debating whether we measure success in terms of dollars or in terms of human rights. We are debating whether accumulating possessions is more important than ensuring access to health care. And we are even debating whether or not poverty is a moral issue. This has never been more apparent than with the reaction to the Supreme Court’s decision that the Affordable Health Care Act is Constitutional. The fact that people have different opinions about the decision doesn’t bother me. I expect that. Different opinions are healthy. What bothers me is the judgmental comments and self-righteous outrage that some people expressed. Since a public school teacher depends on the government (i.e., taxpayer dollars) for her paycheck, I was dumbfounded. I wonder how she would react if the country engaged in a debate about the importance of education and whether we are infringing on taxpayers rights by requiring them to pay for education. At some point, our country embraced the belief that education is a right that every child deserves. We even took that concept a step further and mandated that children stay in school until a certain age. If the issue were being debated now, there’s no doubt some people would be screaming that requiring children to go to school is unconstitutional and that hard-working taxpayers shouldn’t be responsible for the education of others. Thankfully, most people recognize the importance of education, the benefit it has on a person’s future and the positive impact on a community’s economy. The same benefits can be attributed to access to health care, so I’m not really sure why we are so divided about the issue. Instead of debating how to help people, we are debating whether or not we even should. Take, for example, the comments of the previously mentioned public school teacher who claimed the concept of the Affordable Care Act is immoral. Last time I checked, helping others was the definition of morality, not immorality. But logic isn’t everyone’s strong suit. Many of the same people advocating for personal responsibility are also outraged that the individual mandate is part of health care reform. As explained to me, the purpose of this mandate is to encourage responsibility by requiring people to either purchase health insurance or pay a penalty to help cover the government’s costs. Don’t get me wrong. I don’t think the Affordable Care Act is perfect, but at least it’s a statement about what a lot of people think is important. Actually, most people probably think access to health care is important. The dividing issue is about whether it is important for all Americans or only those who have employers or bank accounts that can cover the costs. The debate isn’t going to end anytime soon. And with the presidential election season getting into full swing, discussions will get even more discordant. I just hope that whatever the outcome, Americans can look back at the repercussions of this time with pride rather than shame. I hope we can say this is a time we stood up for the rights of all rather than for the benefit of some. And most of all, I hope we don’t divide and even burn down our house with our heated differences.